Let's talk about Windows 7 Home Basic Features, Softwares and System Hardware Requirements. Problems, Issues, Errors, Tips, Articles, Reviews, How-to, Help and Support. This edition is slightly more usable for users than its crippled predecessor, the Windows 7 Starter Edition. The operating system was marketed keeping into mind users from developing nations, including Bangladesh, India, Pakistan, Philippines, and Thailand. The operating system is the only version of Windows 7 that has geographical activation restriction. This means that if you live in a country where Windows 7 Home Basic edition is not supported, you will not be able to activate the operating system even if you somehow purchase and install it. Apart from the above restriction, Win 7 Home Basic edition has several features blocked. For one thing, several features of the Aero theme are disabled in the Home Basic edition of Windows 7, though you can still apply the theme. Also the 64-bit disc is not supplied with the installation media pack. If you wish to install 64-bit version of the operating system, you will have to order it separately from Microsoft. HomeGroup Support: If you have installed the Home Basic edition, you will be able to join a Home Group network. You will also be able to transfer files, play your media files remotely, and a lot more. However, you will not be able to create a Home Group network in this edition. Windows Media Player 12: The Home Basic edition ships with the latest version of Windows Media Player. So, expect superior playback of all your media files. Windows Desktop Manager: This utility allows you to customize desktop settings as per your requirements. Windows Mobility Center: This utility puts your frequently used settings for mobile PC in one place for easy, one-click access. You can also sync files and folders on your desktop PC with those in your mobile PC. Windows 7 HomeBasic edition, in spite of the restrictions, can get internet surfing and office jobs done with minimum fuss. If these are your only requirements, then this version should be adequate for your needs. What do you think about Windows 7 Home Basic? 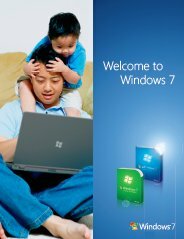 Do you have any Windows 7 Home Basic experiences, ideas, article, story, opinions, errors, problems and tips which you would like to share? Why not take a few moments and Share it with everyone!